Martha Tillson speaks at a December 2017 Commencement ceremony. UK Photo | Mark Cornelison. LEXINGTON, Ky. (Feb. 23, 2018) — In keeping with University of Kentucky tradition, a student will be selected to speak at each of the four UK Commencement ceremonies this May. Because doctoral, master's and baccalaureate degree recipients are now recognized together based on their colleges, the selection committee will accept applications from students with all degree types, not just undergraduate students as in past years. Students receiving a doctoral, master's or undergraduate degree at the May 2018 Commencement interested in speaking must submit their application by 8 a.m. Wednesday, March 28. Students who wish to apply must submit a resume and a copy of their three- to five-minute proposed speech no longer than three-typed, double-spaced pages. In addition, applicants must have contributed to the university through campus, community activities or through their chosen field of study and show evidence of demonstrated public speaking ability. Incomplete applications will not be considered by the selection committee. The committee may contact any applicant for a 15-minute interview and speech demonstration. Applications are available online at www.uky.edu/Commencement/speakers.html. 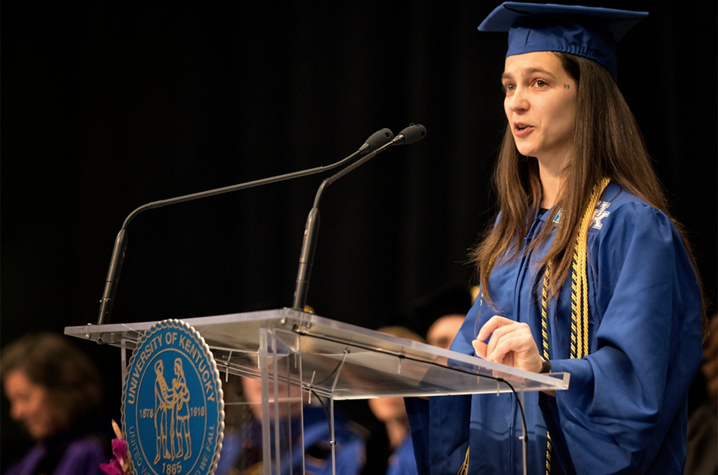 To accommodate rising numbers and to provide a better experience for UK graduates and their families and friends, the university now holds four ceremonies over the course of two days. All four will be held at Rupp Arena. All May graduates should register for Commencement at www.uky.edu/Commencement.